Get more room inside of your Subaru Outback with Curt Roof-Mounted Cargo Carriers! They serve as a simple yet effective solution for maximizing the storage area of your vehicle. With their strong steel construction and durable black powder coat finish, they easily stand up to the tough trails and long miles ahead. With Curt Cargo Carrier on you would be able to prevent your next outdoor adventure from accidentally going viral and enjoy it to the fullest! Augment your cargo capacity easily with Curt! 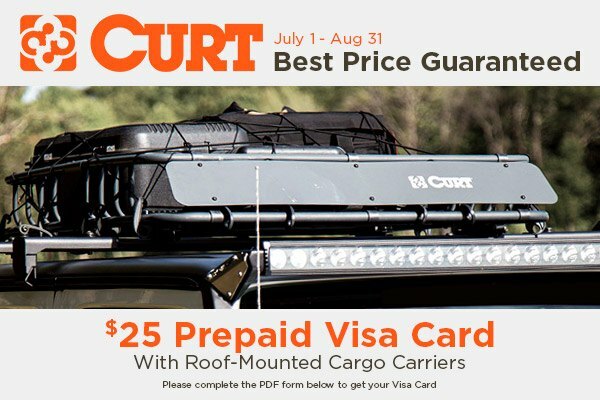 Order Curt Roof-Mounted Cargo Carriers and receive $25 Prepaid Visa Card. This limited time offer is valid from July 1 through August 31, 2018.